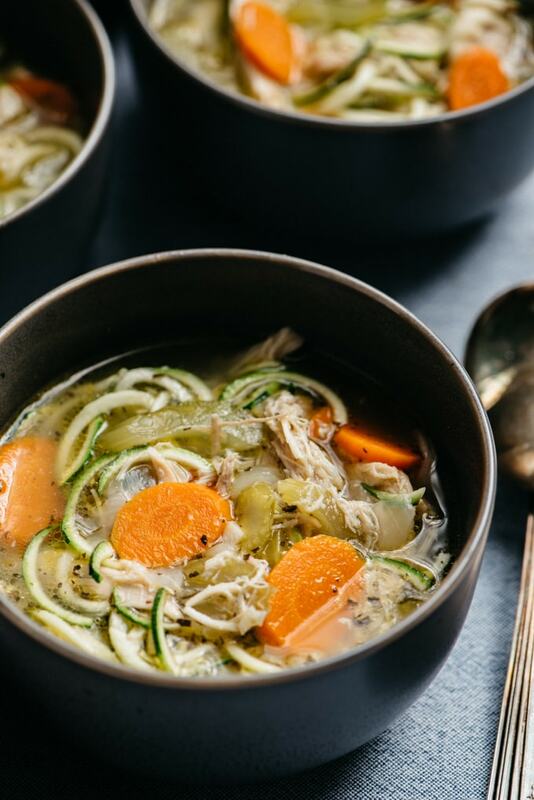 Chase the cold weather blues away with this nourishing for the body and soul chicken zoodle soup. Made from scratch using a whole chicken, the broth is rich and buttery with that “homemade by mama” flavor that can’t be beat. You won’t believe how easy and satisfying this low carb and Whole30 compliant soup recipe is, nor how fast your kids (and you!) will slurp it down. >>> Pin it now! 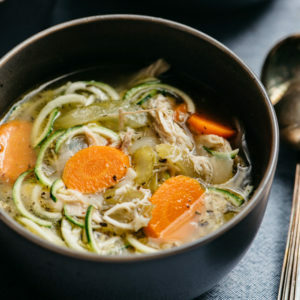 Click here to save this Chicken Zoodle Soup to your low carb or soup recipes board on Pinterest. Current situation: there is a “possibility” of inclement weather over here in western Maryland. Therefore the schools have preemptively closed three hours early, the grocery store was bananas this morning, and I’ve got the fireplace doin’ it’s thing. Meanwhile there’s a polar vortex spreading across the midwest, which totally reaffirms my decision to live on the east coast below the Mason-Dixon line for life. This is about as cold as I can take it friends! I’ve also got a stash of this chicken zoodle soup defrosting, because sometimes I’m super smart and think ahead. Golf. Clap. For. This. Mama. This soup is the antidote to all of your cold weather woes. Well, this and wool socks. And maybe some bourbon? What’s that you say? All three? YES MA’AM. 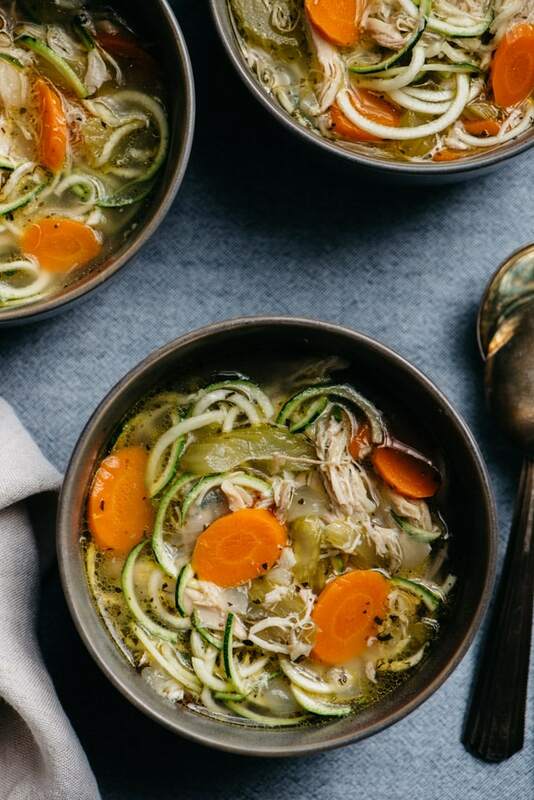 This chicken zoodle soup is a low carb, Whole30-compliant version of the classic. The broth is so complex and satisfying that you won’t miss starchy noodles for a second, and the aroma will transport you back to your mama or grandma’s kitchen in an instant. Do I Need to Use A Whole Chicken? Look and listen friends. For the perfect buttery, rich homemade chicken soup, you want to use a whole chicken, bones, skin and all. You can take the easy way out and buy it pre-cut, or you can butcher it yourself, but do go whole hog. Well, whole chicken. A whole chicken means you get both white and dark meat. YUM. It also means your broth will be infused with the fat from the skin and connective tissues. Fat = flavor, so I say again. YUM. 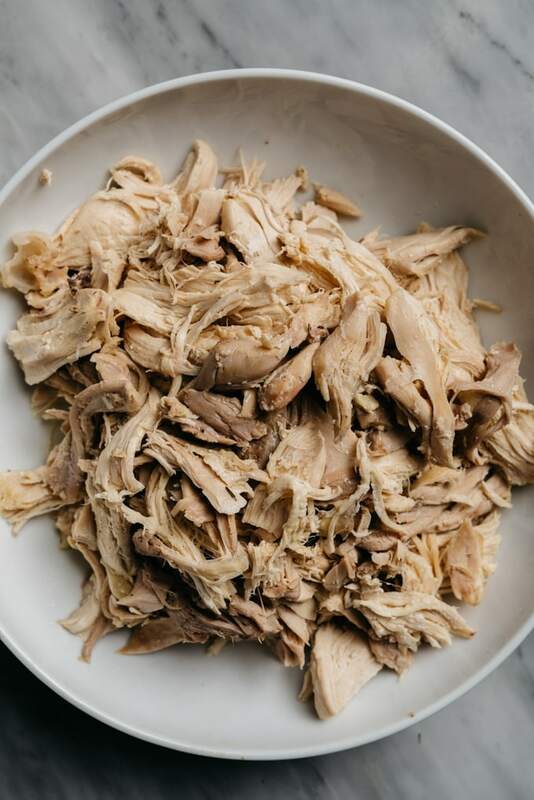 If you’re squeamish about butchering your own or cannot find a pre-cut whole chicken, substitute with an equal amount of various bone-in, skin-on chicken pieces. Two chicken breasts plus four thighs would be the rough equivalent. Let’s get cookin’! Pat your chicken pieces dry, then dust each piece with sea salt and cracked black pepper. Sear the chicken pieces in a little bit of olive oil in a dutch oven. 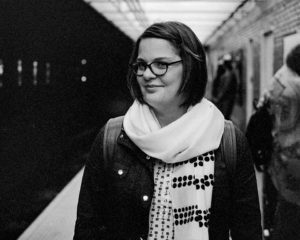 You’ll likely need to do this in batches. The goal isn’t to cook the chicken all the way through, but to simply create a little caramelization on the skin for flavor. 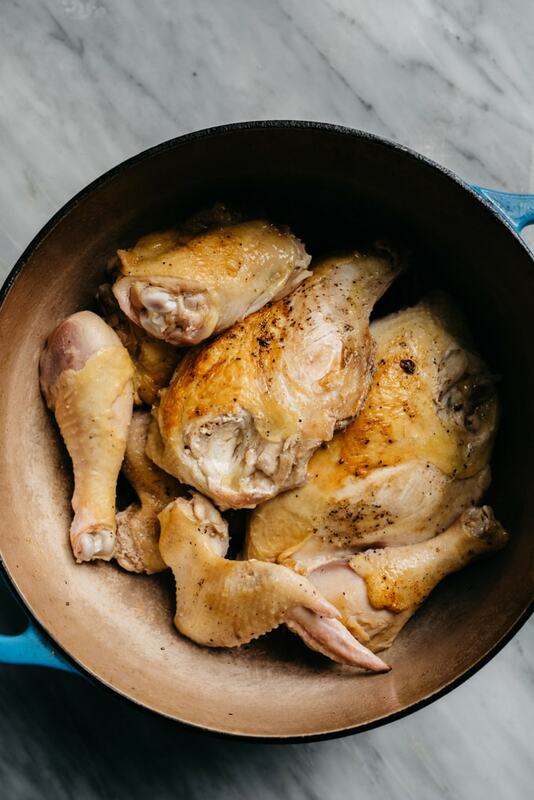 Return all the browned chicken pieces to the pot, top with filtered water, and add a splash of apple cider vinegar, a sprig of fresh thyme and a bay leaf. Now we simmer. This soup needs a good, long simmer, at least an hour but closer to 90 minutes to produce tender, fall-off-the-bone meat and a rich broth. 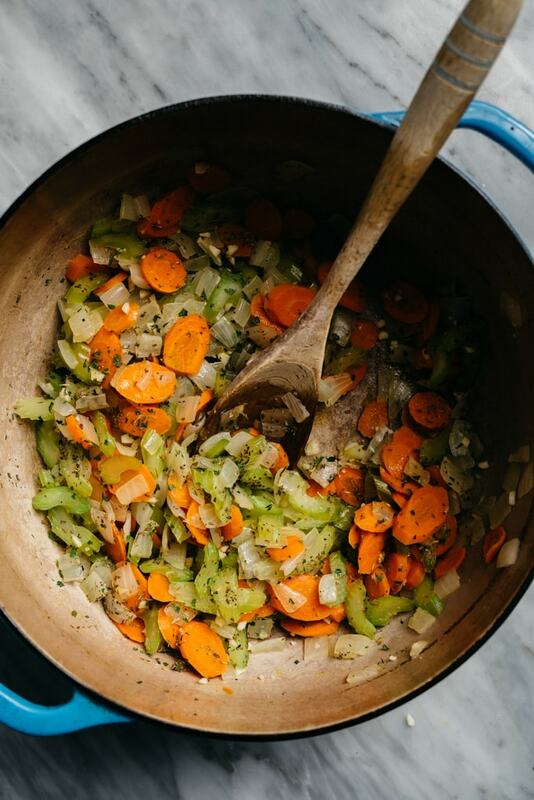 This doesn’t cook long enough to be considered true bone broth, but the skin and connective tissues break down enough to give it depth, flavor, and buttery goodness. Remove the chicken pieces from the broth and set them aside to cool. Then strain the broth through a fine mesh sieve and set aside. Once the chicken is cool enough to handle, shred the meat from the bones. Reserve the bones and skin for a longer simmer session to create a batch of bone broth. While the chicken is cooling, sautee some onions, carrots, and celery. You want to soften, but not brown, the vegetables. Top those guys off with some chopped garlic and dried herbs. Add the chicken broth and shredded chicken back to the pot, and simmer until the veggies are cooked through – about 20 minutes. Finally, taste the broth for seasoning and add additional salt and pepper to taste. I added two teaspoons additional sea salt, and about a half a teaspoon of pepper. You could also add in some fresh chopped parsley for another layer of herby brightness. When you’re ready to serve, spiralize some zucchini and place about a cup of the zoodles into a soup bowl. Ladle the hot soup over the zoodles, stir, and serve! There’s no need to pre-cook the zoodles as the heat from the hot soup will flash cook them just enough to make them perfectly bite-tender. If you’re not interested in the low-carb lifestyle, you can serve this soup over whole wheat angel hair pasta or your preferred noodle. Feel free to use four pounds of various bone-in, skin-on chicken pieces in place of the whole chicken. A combination of white and dark meat work best (breasts and thighs). Short-term storage: store the soup, without the zoodles, in a tightly sealed container in the fridge for up to a week. You’ll notice a layer of chicken fat will form over the broth once cooled. This is what gives the broth body and that velvety texture, so don’t discard it! Simply reheat and it will melt back into the broth. 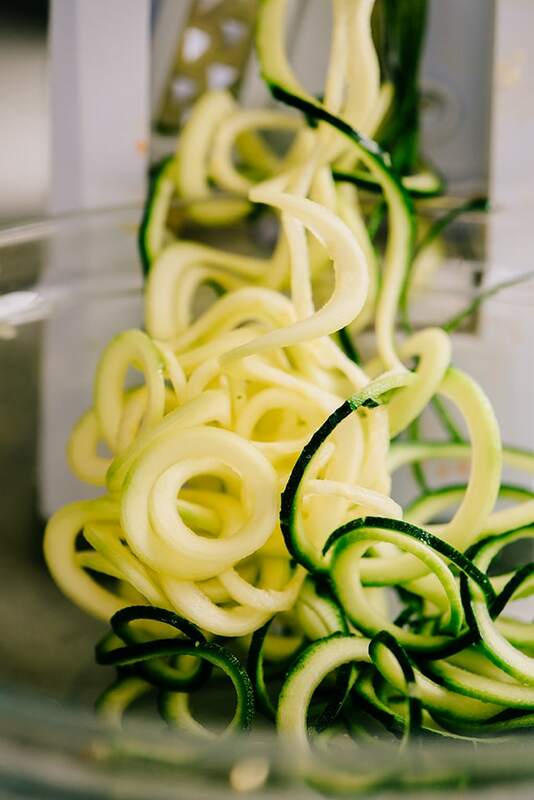 For best texture, store the zucchini whole and spiralize just before serving. Long-term storage: store the soup, without the zucchini noodles, in an air-tight container in the freezer for up to three months. 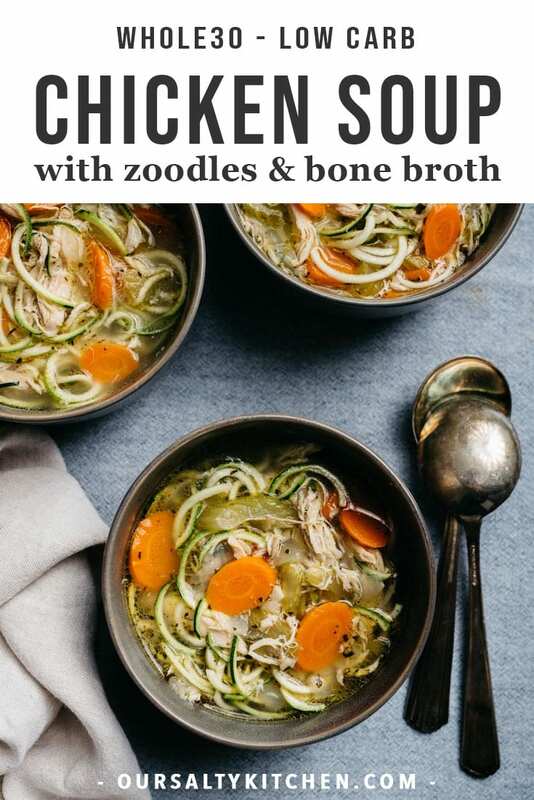 DID YOU MAKE THIS CHICKEN ZOODLE SOUP RECIPE? I WANT TO SEE YOUR CREATIONS! SNAP A PICTURE AND SHARE IT HERE ON PINTEREST. 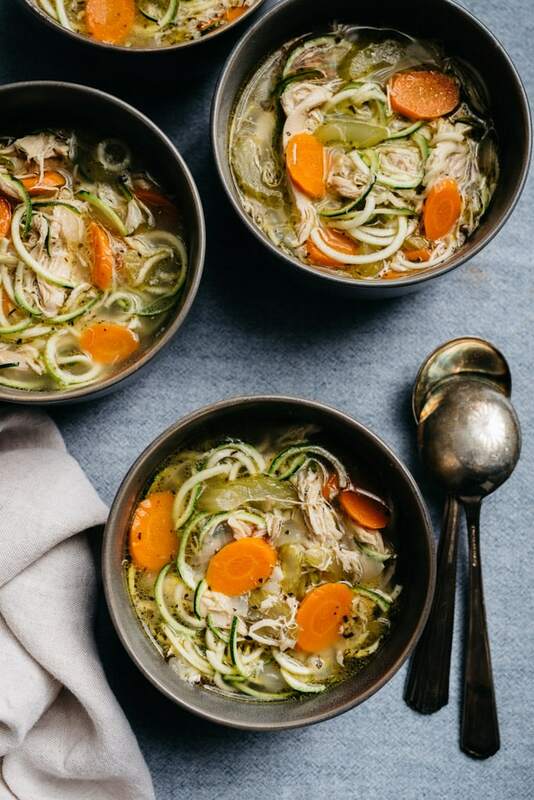 This chicken zoodle soup is a low-carb, Whole30-compliant version of the classic. The broth is so complex and satisfying that you won't miss starchy noodles for a second, and the aroma will transport you back to your mama or grandma's kitchen in an instant. 2 large sweet onions diced to 1"
Pat the chicken pieces dry, then sprinkle with salt and pepper. Place a dutch oven over medium high heat. Add 1 tbsp olive oil and heat until shimmering. Add half the chicken pieces, skin side down, and saute until the skin browns, 5-7 minutes. Remove and set aside onto a plate, then repeat with the remaining chicken pieces. Add all chicken pieces back to the pot. 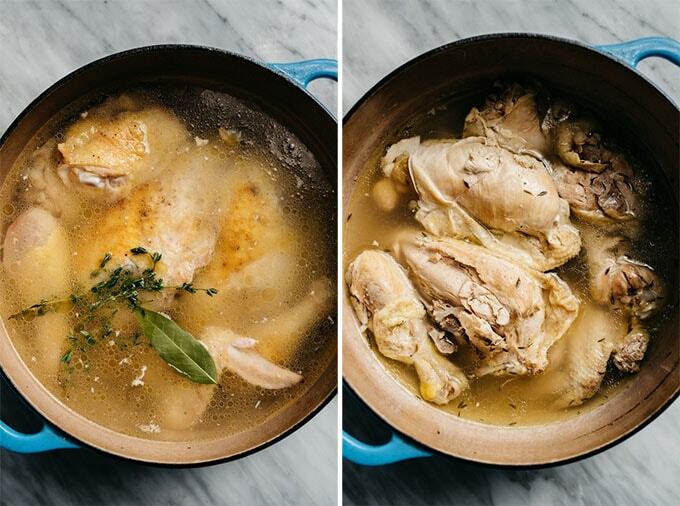 Add eight cups filtered water to the dutch oven, or enough to barely cover the chicken. Add the apple cider vinegar, thyme sprig, and baby leaf to the pot. Increase the heat to high, bring the liquid to a boil, then reduce heat to medium low, or whatever burner temperature is required to maintain a low, even simmer. Cover the pot and simmer until the chicken is cooked through and the meat is very tender and falling off the bone, about 90 minutes. Remove the chicken from the broth using tongs and set aside onto a plate until cool enough to handle. Once cool, shred the chicken. Save the bones for making a long-simmered bone broth. Place a fine mesh sieve over a pot or bowl large enough to accommodate all of the liquid, then strain the broth through the sieve. Return the dutch oven to the stove over medium high heat, add the second tablespoon olive oil and heat until shimmering. Add the onions, carrots, and celery and saute until soft, but not browned, 6-7 minutes. Add the strained broth to the pot, along with the shredded cooked chicken and dried herbs. Increase the heat to high and bring the liquid to a boil. Reduce heat to low and simmer, uncovered, until the vegetables are tender, about 20 minutes. Taste the broth for seasoning, and add additional salt and pepper if required. I added 2 additional tsp salt and 1/2 tsp pepper. Spiralize 1 zucchini per two servings. Place approximately 1 cup spiralized zucchini into a bowl, then ladle the hot soup onto the zoodles. The hot soup will "cook" the zoodles for a bite-tender texture. Serve immediately. 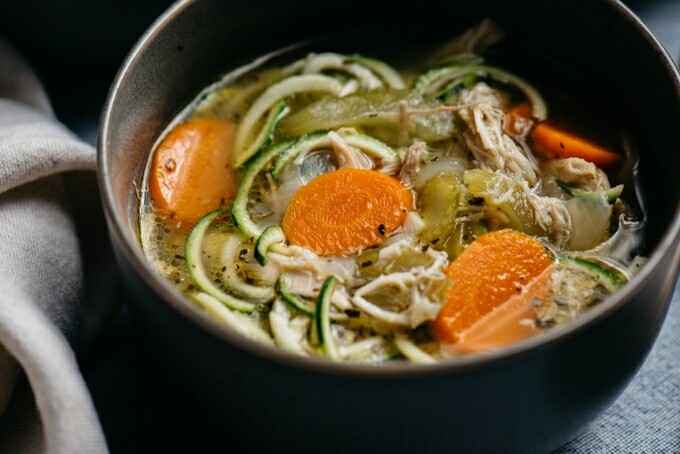 Leftover soup can be store in the fridge with zoodles stored separately for up to a week, or in the freezer in a tightly sealed container for up to three months.